Honey fungus or Armillaria is the common name given to a species of fungus that attack and kills the roots of woody and perennial plants. It thrives in dead tree stumps and spreads from there to healthy plants via flattened bootlace-like threads called rhizomorphs. How do you know if I have honey fungus in my garden? There are a number of symptoms that could indicate the presence of honey fungus in your garden. You might notice the leaves dyeing back earlier in the year, poor leaf growth, early autumn colour, a failure to produce any blossom and at the other extreme a very heavy crop of fruit just before death. Fruiting bodies (mushrooms) are sometimes seen growing around stumps and on trunks or on the ground in late summer or autumn. Other signs are the presence of sheets of white creamy paper-like growths under the bark with a distinctive mushroom smell. What species does it attack? What can be done to eradicate it from my garden? There are no chemical solutions to honey fungus. 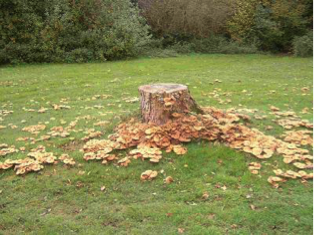 Leaving a stump after a tree has been felled provides an ideal opportunity for honey fungus to take hold and therefore the stump and any old stumps should be removed either by digging or grinding the stumps out. The area can be replanted again with a replacement tree about 18 months after the stump has been ground out though annuals and herbaceous perennials are not generally affected by honey fungus.